The ex-gangster says he was 'stunned' that Bulger had been an FBI informant, and placed him in murder scenes. BOSTON — An ex-gangster who admitted killing 20 people was unemotional Monday when describing his line of work at the trial of his former partner, James “Whitey” Bulger, but called himself heartbroken when he learned that Bulger had become an FBI informant. John Martorano gave short answers and spoke nonchalantly when questioned by a prosecutor about a string of murders he committed while he, Bulger and Stephen “The Rifleman” Flemmi were members of the Winter Hill Gang. “They were my partners in crime, they were my best friends, they were my children’s godfathers,” Martorano said. He said he named his youngest son James Stephen after Bulger and Flemmi. “After I heard that they were informants, it sort of broke my heart,” he said. 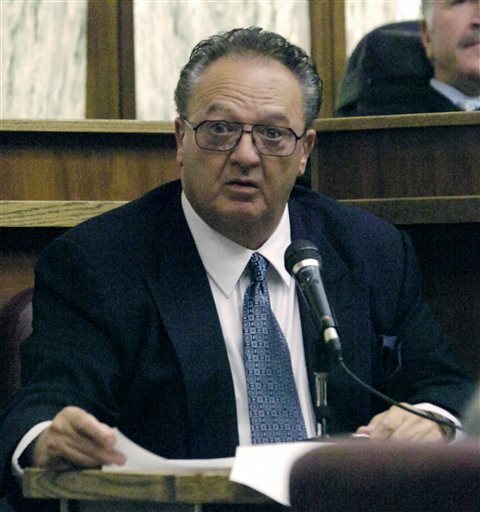 Martorano, 72, served 12 years in prison after striking a cooperation deal with prosecutors. He was released in 2007. Bulger, now 83, is charged in a broad racketeering indictment that accuses him of participating in 19 murders in the 1970s and ’80s. He is also charged with extorting bookmakers, drug dealers and others running illegal businesses. Martorano, 72, is one of three former Bulger cohorts who cooperated with the government and agreed to testify against Bulger and others in return for reduced sentences. In his testimony Monday, Martorano described what he said was Bulger’s involvement in several killings, saying that while he shot someone from a car, Bulger and others would ride in a second car to intervene if anyone tried to stop the shooting. He described the death of one victim, Alfred Notarangeli, in 1974. On March 8, 1973, Martorano said, he drove in the lead car while Bulger followed, both tailing a Mercedes they believed was driven by Notarangeli. “We pulled guns and we were shooting at it,” Martorano said, referring to himself and another member of the gang. They later learned that it was not Notarangeli in the car, but instead a man named Michael Milano, who was shot to death. Martarano said they continued to chase Notarangeli and ended up killing him and his brother, Joseph Notarangeli. Bulger is charged in the killings of both brothers, as well as Milano’s killing. Martarano also described how he said Bulger first became involved with former FBI Agent John Connolly Jr. He said Connolly met with Bulger’s brother, former Massachusetts Senate President William Bulger, in the mid-1970s to express his gratitude for being a mentor to him and to offer him help if he ever needed it. Martorano said that after that, Connolly helped the gang by tipping them off to investigations and said Connolly suggested to Bulger that he give Connolly money.